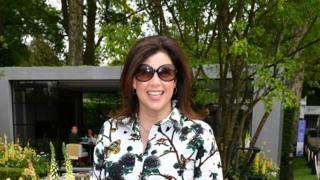 Television presenter Kirstie Allsopp has defended her decision to sit separately from her sons when flying. Ms Allsopp told the Sun newspaper that she and her partner sometimes sit in the business class cabin, while her children, 10 and 12, sit in economy.Some have suggested she "look after" her children and sit with them.This, Ms Allsopp said - was "utter rubbish", adding that having her sons in premium seats seemed "an absurd waste of money" and "very spoiling".She pointed out the money saved from not buying two more expensive seats allows her family to "take a shed load of holidays". But others have said questioned the impact on other people on the flight. One former crew member said it was "unfair" on staff and other passengers who end up as "babysitters". Responding, Ms Allsopp said she always introduces herself to the cabin crew and tells them to alert her in the event of any problems.Others pointed out that some airlines separate families on flights (in the same class), unless an additional fee is paid. "This isn't bad parenting, it's about choice," one Twitter user wrote. "Teaching kids a degree of controlled independence is important," another added. The Location, Location, Location presenter said people parent differently and she was more concerned by the dangers of social media than air travel.Last year, celebrity chef Gordon Ramsay also revealed he and his wife fly first class, while his children sit in economy. » Is the single life more expensive? » The Presidents Club: Are charities allowed to return money?